I want to love streetcars. I really do. Who doesn’t want to go rolling through your neighborhood, bells dinging and clanging, like you’re living in a Rice-A-Roni ad? But just when you thought these antiquated relics of the Victorian Era were dead, now Streetcars: The New Batch are coming to your city. Or that’s what some very idealistic urban planners would like to see happen. But we don’t have to let them. Don’t get me wrong. Streetcars are fun! They turn cities into theme parks, adding a sense of vibrancy to busy streets. That’s why US cities like Dallas, Atlanta, DC, Charlotte, and Kansas City have just opened brand-new streetcars. Other US cities like Los Angeles, Oklahoma City, Detroit, Cincinnati, Sacramento, and Milwaukee have their own plans. 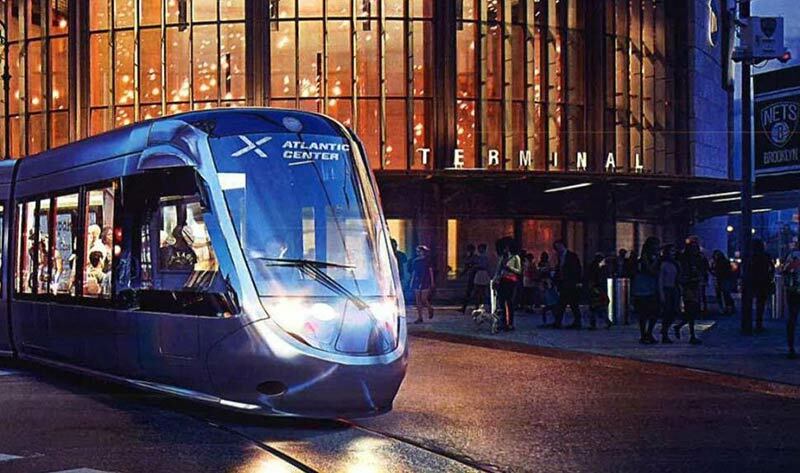 The most recent proposal, a new and very expensive plan for a streetcar named the Brooklyn-Queens Express, or BQX, is surfacing all sorts of concerns about whether these are an appropriate way for cities to spend transportation dollars. Are they actual transit solutions? Or just pricey boondoggles? To be clear, a streetcar should not be confused with a light-rail train, which is more of an above-ground subway that’s part of a more extensive transit system. A streetcar runs a very short, dedicated route, usually a loop. This is called “Urban Circulator Service,” which is what most American cities are proposing. Streetcars usually don’t run particularly fast and they might make a lot of stops in a dense urban area. Most streetcars also run “at-grade,” which means that their rails are right there on the street, and in many cases are subject to the same traffic-related delays as all the rest of the motorized vehicles on that street. In many cities, tests have proven that people can actually walk faster. Okay, so if these neighborhoods are underserved by transit, why not add a bus and save the $2.5 billion? Well, buses have their own problems. They get stuck in traffic, too, of course, and they suffer from bad reputations for being smelly and crowded. A bus isn’t seen as “world-class transit.” A sleek brand-new streetcar is exciting! But is it really? Does anything about this rendering say to you, 2016? Or, rather, 2024, when it will be finished? This does not look like the future. It looks like something proposed for Brooklyn in 1986. This thing looks only marginally more progressive than the streetcars Brooklyn already took off its streets once—in the 1950s. In a very convincing op-ed, Yonah Freemark, a city planner in Chicago, points out that great streetcars are not impossible. (Example: Pretty much any city in Europe.) However, dedicated lanes are necessary to make sure that streetcars move fast through traffic—at least faster than walking. But if a city like New York is going to go ahead and build the dedicated-lane infrastructure, why not just save decade and a billion or so bucks and just run some extra-long (these are named “articulated”) buses? Yes, the better solution here, and in most places in the US that need this fix now, is a really, really awesome bus line. With sharp new vehicles and dedicated lanes, but also high-tech tools like smartphone ticketing and user-friendly kiosks. You make the stations visible with art-covered canopies to protect them from sun and rain, and outfit them with furniture as comfortable as urban living rooms, adding street plazas and gardens and cafes and free wifi to make the whole experience a billion times better than the subway ever will be. Guess what: New York City has this already. It’s Bus Rapid Transit, or BRT, which has taken hold as a cheaper, more efficient alternative to rail in many cities around the world. It has already been proven to improve congestion and reduce emissions. In New York, this idea just needs more attention paid to its on-street infrastructure to help sell it to the streetcar audience. Tell me that the visionary urban designers who turned a derelict rail route into The High Line, one of the most copied parks in the world that completely transformed the western edge of the city, can’t design a revolutionary bus service which can serve as many riders as possible and lure that all-important investment to these neighborhoods. It can be done. When done right, streetcars can hypothetically get plenty of cars off the street, which is exactly what most American cities need to do. But these communities need better transit now. Sure, it might be fun to ride the streetcar from Greenpoint to Red Hook to dine on artisanal in-vitro meatballs at IKEA 10 years from now. But I think any one of those people who live in any one of those neighborhoods along the way would prefer a brand-new, fast, dependable bus that launched next month.